Dining at Franschhoek Kitchen. 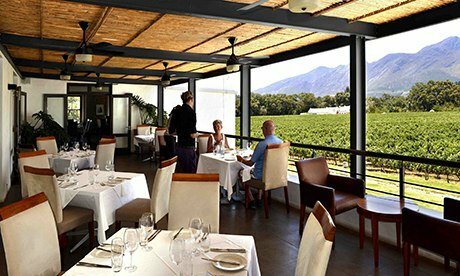 Photograph: John BruntonTucked away down a country lane just outside bustling Franschhoek, this funky restaurant of the Holden Manz winery has idyllic views over vineyards with a stunning backdrop of towering mountains. Chef Maryna Frederiksen cooks simple, well-priced bistro dishes based on seasonal, locally sourced products, such as pumpkin gnocchi, oak-grilled trout, or slowly braised pork belly paired with sweet potato mash. You can also order a picnic hamper for £9 per person and sit out where the vines taper off by a bubbling stream. Holden Manz is a relatively new estate, but their dynamic 30-year-old winemaker, Schalk Opperman, is already winning prizes for his excellent blend of cabernet sauvignon and franc, and a fragrant rosé that when you close your eyes makes you think you are in Provence. The owners run a hip contemporary art gallery in Franschhoek and rent out five luxury cottages by the restaurant. Wine pairing at Fyndraai Restaurant. Photograph: John BruntonThe sprawling 320-year-old Solms-Delta estate sits near the border between the vineyards of Franschhoek and Stellenbosch, and both the winery and restaurant are unique places to visit. Young chef Shaun Schoeman is reinventing classic Cape cooking by mixing ingredients and flavours from native Khoi nomads with Afrikaner and Cape Malay influences. You’ll need to ask the waiter to explain local plants like the aromatic koekemakranka, but the food is delicious and many of the rare indigenous herbs and fruits are grown on the farm itself. 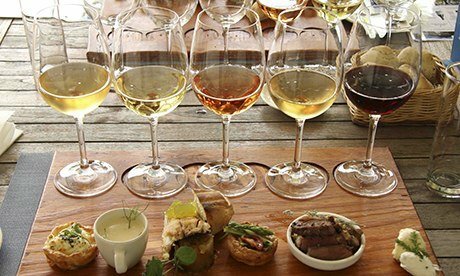 The four-course heritage menu costs £9.40, or for the same price, choose a wine pairing, where six glasses of the estate’s wines are accompanied by six tasty tapas, like smoked snoek pâté (similar to mackerel pâté), chicken broth with wild fennel, braised lamb and a white carrot purée. 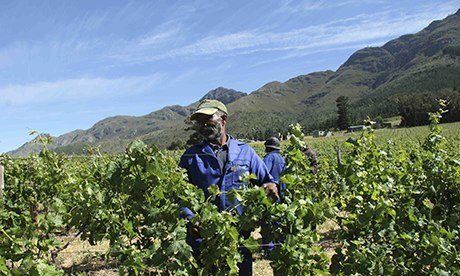 There is a big effort at Solms-Delta to address the apartheid legacy, with a museum that examines the slave-labour history of the farm, while today, one third of ownership has been handed over to a cooperative of the farm’s workers. Readers Restaurant is a good spot for a glass of wine – and maybe some unusual homemade ice-cream. 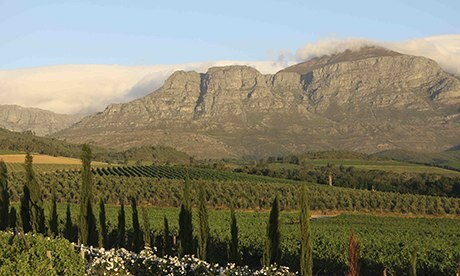 Photograph: John BruntonTulbagh is well off the Cape’s usual wine routes, a quiet valley with several outstanding cellars to visit, especially Rijk’s, where Pierre Wahl, makes some of the best chenin blanc and pinotage you will taste. Tulbagh itself is a sleepy, picturesque town, where 18th-century Church Street has been immaculately rebuilt after an earthquake in 1969. One of its most beautiful white, thatched cottages is where Carol Collins runs the Readers Restaurant, a favourite local hangout, where she cooks a mix of modern recipes like tuna steak with wasabi butter, and tasty traditional dishes such as bobotie, a unique Cape Malay curry with rice and sambal. 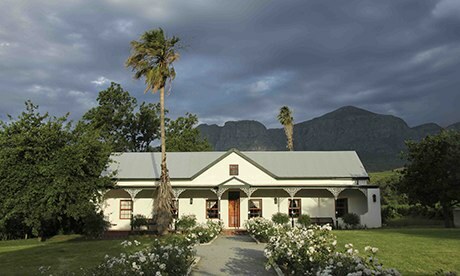 This is a great place to taste Tulbagh wines with over 50 local vintages on the wine list. And don’t miss Carol’s exotic homemade icecreams – flavoured with everything from balsamic to olive oil. Main dishes cost around £5.70, with wines beginning at £3.70 per bottle. Under the thatches of Basse Provence. Photograph: John BruntonProvence was the name of one of the original nine farms given to Huguenots who settled in Franschhoek (meaning French corner) after fleeing France in 1688, and today the four idyllic cottages of Basse Provence offer one of the best B&B deals in town – comfy and cosy rather than the five-star treatment offered by many wine estate hotels. 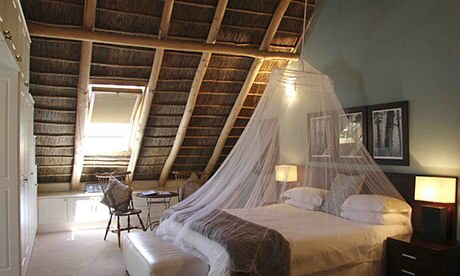 Looking out over vineyards, the spacious bedrooms of these white, thatch cottages are elegantly furnished in art-deco style with a breakfast room and lounge decorated like a rustic country manor with antiques and paintings. Each cottage has a pool and the obligatory braai, for cooking up a barbecue, while a short path through the vines leads to the cellars of Rickety Bridge, which owns Basse Provence. Ask for a tasting with the winemaker, Wynand Grobler, who makes a crisp semillon, one of Franshhoek’s historic grapes, and an excellent MCC – nothing to do with cricket but a methode cap classique, South Africa‘s very drinkable bubbly. Diemersfontein’s manor houseDiemersfontein is the perfect place to stay and explore the up-and-coming wineries that surround the busy town of Wellington. There are reasonably priced guest cottages with kitchenettes dotted around the lush gardens of the estate, but the best idea, with no difference in price, is to reserve in the historic Manor House, where you can taste wines sitting out on a shady colonnaded verandah. The rooms are comfortable, many with four-poster beds and mosquito nets, and guests get the run of the plush family salon, which is like stepping back into colonial days. 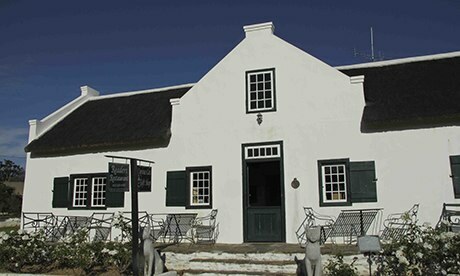 But the owner of Diemersfontein is anything but stuck in the past. David Sonnenberg is actively engaging his farmworkers in ownership, running a separate wine label and aiding them to buy property in town rather than living on the estate. His wines are radical too, as his cellar master invented coffee pinotage here – putting toasted barrel staves in steel vats to give the rich red pinotage wine a mocha aroma and flavour – which experts treat as heresy despite a huge commercial success. Buy his bargain For The Birds wine (£2.60) and 10% goes to a charity saving seabirds, especially the Cape’s endangered penguins. Working the vines at Chamonix. Photograph: John BruntonA new generation of bold thirtysomething winemakers is transforming the bucolic Franschhoek valley into the most exciting region for Cape wines right now, and this is typified by Gottfried Mocke at the stellar Chamonix winery. A narrow road takes you high up into the mountains to Chamonix’s cellar, where a 17th-century blacksmiths has been converted into a tasting room and casual restaurant. Call Gottfried first and he or one of his assistants will show you round the cellar, where he experiments with vast oak casks and smaller French barrels, classic steel and cement tanks and the latest trend, Nomblot Eggs weird-looking concrete vats that could be in the next Doctor Who episode. And the wines are diverse too, from a fruity, unoaked chardonnay to a luscious 2009 sauvignon, which Gottfried deliberately holds back “because people here are becoming interested in how wines develop rather than wanting to drink everything young”. He also makes a wonderfully supple pinotage, and a pinot noir that could rival a top burgundy wine. 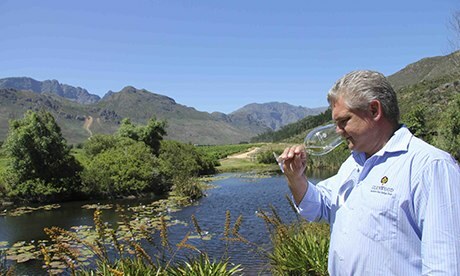 Winemaker Adi Badenhorst. Photograph: John BruntonFor a completely different experience in Cape wine tourism be sure to visit the Swartland, a region previously known for its wheat production, where a new generation of maverick vignerons are breaking down traditions. 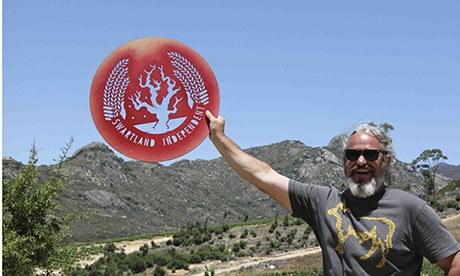 Book an unforgettable visit with the charismatic Adi Badenhorst, a founder of both the Swartland Revolution, a wild annual wine festival, and the Swartland Independent Producers Association. Don’t expect the usual elegant tasting room – there isn’t one – as Adi starts opening bottles from a battered old fridge in his garage cellar, while putting 1970s soul on his vintage turntable. He bought the 30-hectare estate in 2007, for one main reason: “the vines date back to the 1950s, and are what we call bush vines, free-standing, low off the ground – they look so funky and make great wines!” He creates mainly red and white blends of different grapes – more like an alchemist than winemaker– and regularly releases a Funky White – this year something similar to a vin jaune from the Jura, while in the cellar he is experimenting with a natural no-sulphur “orange wine”, using the muscat de frontignan grape. He already brews his own beer and future projects involve sherry and brandy. Young vines at Tokara. Photograph: John BruntonNo trip to the Cape vineyards can miss out on Stellenbosch, the unofficial capital of wine tourism, home to the university where future South African winemakers study and the nation’s most famous grape, pinotage, a unique cross of Burgundy’s pinot noir with Châteauneuf-du-Pape’s cinsault, or hermitage, was created in 1925. 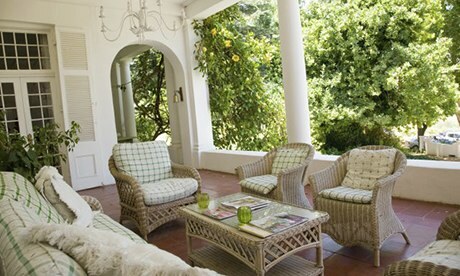 For a taste of tradition – and great pinotage vintages – stop off at an historic, traditional estate, such as Kanonkop. But if you only choose one winery, then Tokara is the future for this region. To begin with, wine tastings are free (almost unheard of in Stellenbosch); the modern cellar features startling avant-garde art and architecture; and dynamic oenologist Miles Mossop makes refreshing, modern wines. 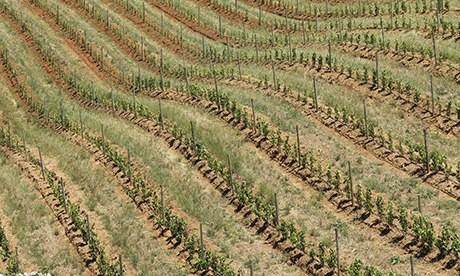 Sadly the majority of Tokara’s pinotage vines were destroyed recently in a fire, but be sure to try the powerful syrah and the outstanding sauvignon blanc. There is a casual deli and gourmet restaurant by the tasting room, and this is also the place to try fruity South African olive oil, as the farm has 60 hectares of olive groves.